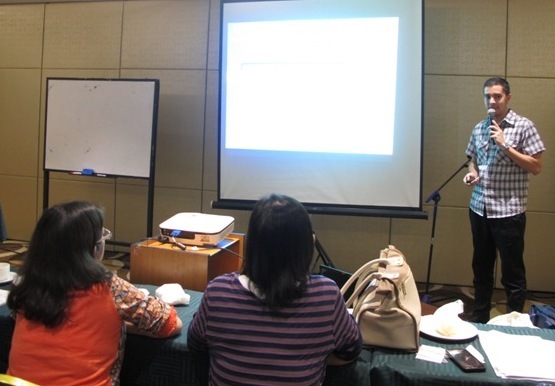 Key personnel of ACTION and the Department of Social Welfare and Development Office (DSWD) attended the Japan International Cooperation Agency‘s (JICA) – Philippine Office’s Training on PCM-based Project Designing and Planning for TCGP Partner Organizations held on February 10-12, 2016 at Subic Bay Travelers’ Hotel, Subic Bay Freeport Zone. The training was also attended by other organizations which have existing projects under JICA’s Technical Cooperation for Grassroots Projects (TCGP). JICA-Philippine Office organized this training to help their partner agencies in the management of development projects under the TCGP assistance scheme. The trainers discussed project design [using the Project Design Matrix (PDM)], and plans, including monitoring & evaluation framework to ensure the successful project completion in the context of the Project Cycle Management (PCM). ACTION project documents were utilized to enrich the discussion. In the Philippines, TCGP started in 2002. It is an opportunity for Japanese NGOs, universities, local governments & small and medium enterprise to participate in grassroots development efforts while creating an experience-sharing environment and nurturing Filipino-Japanese friendship. ACTION and DSWD’s project is one of the 24 on-going TCGP in the Philippines. ACTION, in partnership with DSWD, is yet to implement its JICA-funded project: Ensuring Children’s Potential for Development and Independence through Improved Residential Care Practices from April 2016 until January 2019. This is the second project of ACTION under the JICA-TCGP scheme. ACTION: Empowering Children to Realize their Dreams!